Most people visit Cairo for the Pyramids at Giza, Sakkara and Dashur. Many do it also for the medieval mosques in Islamic Cairo. But Cairo as a shopper’s paradise like Hong Kong or Bangkok? Not quite. However, we’ve spent the past couple of days exploring the underbelly of Cairo’s gold traders, in search of a wedding ring (no, not mine!) Jewellery is dictated by fashion, make no mistake. And the fashion at the moment in Egypt is for Seriously Big Bling. So when Fee turned up in town with her little, white hands and a taste for the understated, it became immediately obvious we were in for a rough time. We visited the gold strip in Misr el Gedida (Heliopolis) near Midan Salah El Din, and also the gold traders of Khan al-Khalili and Sharia El Muizz. The shops ranged from luxe emporiums to tatty offices where dealers pulled trays of diamonds out of secret compartments behind their knees and talked about the colour H and vvsi grades of clarity, princess cuts and claw settings. It was a learning curve for both of us. We weren’t the only shoppers. While a few Christmas tourists poked their noses into the shops, Egyptian buyers were busy poring over the trays of gold, lured by enormous diamonds and rich yellow, 18-carat extravaganzas. None of Australia’s pale, limp 9-carat wanna-be gold. Interestingly, it’s the ladies who wear the most gold in these parts. The precious metal is considered to be detrimental to men’s health, so most men wear a silver wedding ring. I’m ok with that. With gold prices at an all-time high as investors seek safe investments, grooms get off pretty cheaply. Not like the brides. 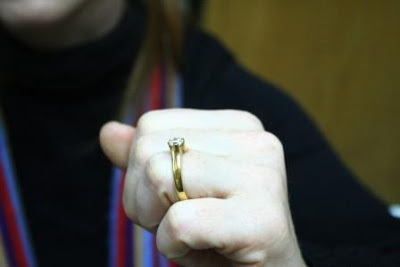 Rings ranged from pretty little trinkets from young men to their intended bride to no-holds-barred golden knuckle dusters that have you dragging your hands on the ground under their weight. The main thoroughfare of El Muizz is lined with gold and silver shops (not to mention other businesses selling lanterns, plaster busts of Nefertari, pyramid fridge magnets, inlaid chess boards, chandeliers, tatty jewellery and a never-ending stream of tassle-laden shisha pipes). All through the night the cobbled street rang with the sounds of the zaghroota, the elated wail that Arabic women do when they’re celebrating. Weddings especially. “It can make a man’s blood rise,” an old man confided to me once. “What’s that woman screaming for?” asked a concerned Fee. Different ears, different interpretations. Fifteen shops and three shopping sessions later, we have found the ring (a sweeping solitaire), negotiated the price (of course, more than the original budget) and organised for the resizing. The bling, my friends, is in the bag. 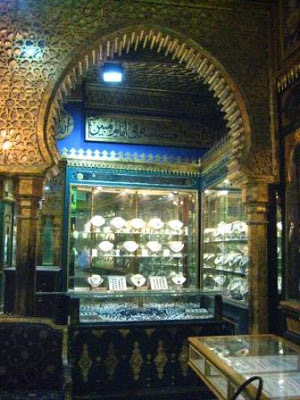 PS: If you’re jewellery shopping in Cairo and want some contacts, we had success finding the ring at the dusty, seemingly empty Ahmed Hosny & Sons at 99 Sharia El Muizz and are getting work and diamond done at the lovely Gouzlan, beside Naguib Mafouz restaurant in the heart of Khan al-Khalili. It just doesn’t feel like Christmas here in Cairo. No matter how many plump plaster-cast reindeers and glitzy gold Christmas trees in the mall. No matter how many boys selling Santa hats (including a frightening,’Silence-of-the-Lambs’-style with an eyeless, flayed rubber Santa face hanging below the fringe. No matter how many times Nile FM can play Wham’s ‘Last Christmas’. It’s not surprising considering Egypt’s Coptic Christians celebrate Christmas on 7 January. My one and only work Christmas party was put off till 15 January, however, we made a good fist of it, helped by the fact Christmas Eve is on a Thursday, the Arabic equivalent of a Friday night. So we crashed the Christmas party at the pumping bar, After Eight (reached by walking off the street, through a kiosk selling chocolates and chips then down an alleyway that has actually been cleaned up). The entertainment was a band, two DJs and they also threw in a beautiful belly dancer who had a gorgeous smile but was lacking in the whole hip movement area. The first DJ belted out a fistful of fun Arabic pop, but the second went into deep, heavy dance that lost the holiday bonhomie as well as the dance crowds. Dead Sea mud is supposed to be the oldest elixir of youth. Certainly the water in it is as old as time. The creation story goes that once there was a large ocean covering this part of the Middle East and as the land changed, it split into the Mediterranean Ocean, the Black, Red and Dead Seas and a series of lakes and rivers linking the ancient waterway. The Dead Sea is fed by a stream from the River Jordan, mixing new water with the ancient brine that is so salty that you do indeed bob like a cork. 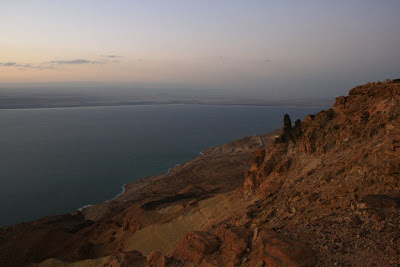 Logic has it that the Dead Sea would taste disgusting. So why do we insist on tasting it? I tasted it. Absolutely gut-wrenchingly gross, a weird mix of sea salt and a deep, medicinal taste of stale water. I walked into the water fearing for the old paper cuts running across four fingers, but they must have closed over because they didn’t sting like I expected they would. Then, while musing this unexpected wonder, I tripped on a stone and grazed my toes. People, I can report that yes it hurts like buggery when the salt gets in. But it’s weird: you know when you swim in a really salty sea, you can see the salt crystals clinging to your skin while you dry? 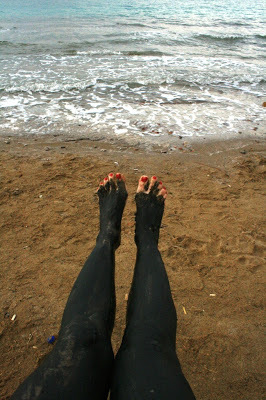 When you waddle out of the Dead Sea, the water clings like an oily film to your skin, which is not unpleasant. I slathered on the black mud, kept company only by the lifeguard – smart tourists were staying off the chilly beach this morning, and that was fine with me. Until, to my mortification, a super-conservative Indian/US Muslim family came down to the wate r’s edge. It is a mark to the wife’s gregarious nature that we struck up a lovely conversation: she in her 18th-century bonnet and long skirts, me in nothing but a grubby bikini and slick of black mud. I am still bewildered as to where the mud actually comes from. I didn’t see any pits but the local boys bring it up each morning to the public beaches and a few dollars will see you smearing yourself with thick, black primordial ooze. Yes, ok. I paid for it. And then I cruised the gift shops so I could pay for it again, but in nicer packaging than a large dirty bucket. The most fashionable lable for Dead Sea cosmetics (face moisturisers, hair masks, eye gel, foot scrubs and yes, just straight bags of mud) is Rivage, a Jordanian-French enterprise with chic packaging and good marketing. There are plenty of B-grade labels, but really, how will packaging make me look 14 again, I ask? The Dead Sea is 400 meters below sea level, the lowest point on earth. Jordanian wine is actually very palatable. Cheap labour comes from Egyptians. 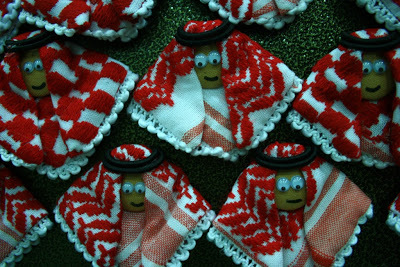 In winter, racing camels are rugged up with a poncho with a hole cut out for the hump to slip through. Jordan is actually the Hashemite Kingdom of Jordan, ruled by King Abdullah. King Abdullah II’s father looked like Sean Connery and his son like Harry Potter. The king’s mother is Scottish. Lawrence of Arabia lived in Wadi Rum, in southern Jordan..
A donkey can set you back US$500. The Dead Sea is oily. 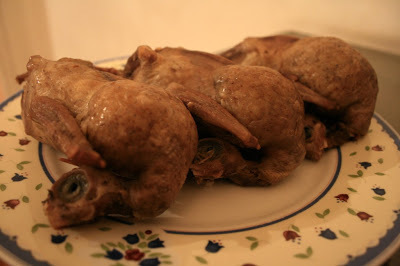 John the Baptist was decapitated. Lot’s wife turned into a pillar of salt, and still stands. Salome danced the dance of the Seven Veils in front of King Herod. 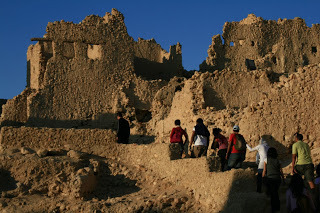 And finallly, if you were looking for it, Jordan is the site of the original Sin City, Sodom & Gomorrah. Tagged: food, Jordan, religion1 Comment on What you didn’t know about Jordan.. I admit it: I have been avoiding Jordan. After a solid effort schlepping around Egypt’s antiquities, not to mention those of Morocco and Iran, I thought the ancient city of Petra, built around the first century BC, would be just wasted on me. I was suffering a serious case of temple burn-out. Show me another Roman ruin, hear me scream. 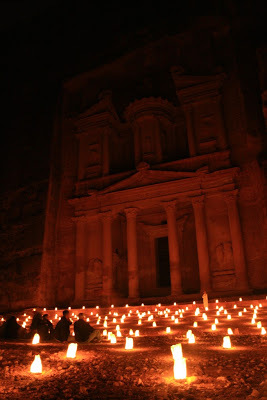 Last night, I finally faced my fears and visited the jewel of Jordan, Petra, by night. The ruins are fabulously intact, and lit by hundreds of candles, an international group gathered at 8.30pm to walk down to the most amazing building, the Treasury. The rules were clear: no mobile phones, no photos and, incredibly, no talking. Silence is the key, as you walk through the Siq, the crack in the canyon that leads into this secretive building. “Please walk in single file, but couples can walk hand-in-hand, and we wish our singles the best of luck,” said the organisers in their opening spiel. Unfortunately, none of the Spaniards in the group (and there were many) heard the instructions because…well, they were all talking. I realised early on in the piece that I’d have to isolate myself from the Continental types and hitch up with the law-abiding northern Europeans and Anglos. Worked like a charm. The canyon’s walls rise up to 80 meters high, dwarfing us in darkness as we followed the trail of candles. When we reached the 2000-year old Treasury building, performers played traditional instruments, eerie in the night air. I spent the whole day today in Petra by daylight, and after walking about 20km, with help from a few trotting horses and plenty of sugar-fuelled sage-infused tea from charming Bedouin women, I’m suffering temple fatigue, again. “And this is where Jesus was baptised,” said the guide, pointing at a dry riverbed. The empty creek is an arm of the River Jordan. From our position in the far west of Jordan, we could see the skyline of Jericho, and later, when the sun went down, the lights of Jerusalem. A short walk along a tree-lined path took us to the river proper, the natural border between Jordan and Israel and Palestine. I splashed cool water at Israel and admired the new buildings on the opposite side of the river. The baptismal site of Jesus is recorded in the Bible, in mosaics on the floor of the ancient church by the site and from writings by travellers of the day. However, there are some who maintain that the baptismal site is actually on the other side of the river, on the Israeli side. The guide told me there is, in fact, only one country making the allegations. Sure you can work it out. Today, we also wandered around the fabulous citadel that rests on one of the seven hills of Amman. It’s suggested the Roman temple was dedicated to Hercules, the find of a massive clenched fist amongst the excavated rubble being a dead giveaway. Fingers the size of an average-sized Jordanian woman. “It’s an historical map, not a geographic map,” said the guide mildly when I queried the fact that Egypt was on the wrong side of the Red Sea. Moses was lost for 40 years on the Sinai peninsula, it would have been longer if he was using this map. Speaking of Moses, the man who led his people to the Promised Land featured prominently today, as I walked up Mt Nebo, where he died and ascended into Heaven – no body was ever found. I’m going to go into a bit of religious theory here, so hang on: one of the fundamentals of Islam is the belief in the prophets, of which there were many, and Moses (or Musa in Arabic) is one of the biggies. So, implicit in the religion is the belief he spent four decades lost in the wilderness, had a hotline to God and shot up to heaven when his time was up. And so ends my first day in Jordan. 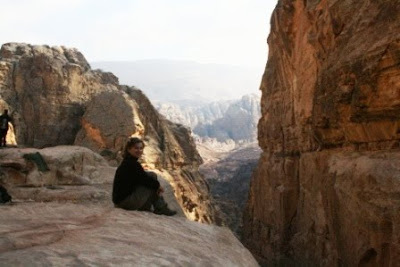 Tomorrow: hopefully shimmy past Sodom & Gomorrah, the ruins of Petra and, if I’m up early, a wallow in Dead Sea mud. It’s an obvious fact that once Cairenes are more than 15km past the outskirts of their town, they must tie a scarf on their heads. Preferably a black-and-white checkered one, and then a pair of mirrored aviator sunglasses, which seem to look good only on Arabs. Inevitably, we Caucasians end up looking like bad Tom Cruise wannabes or misguided PLO supporters. 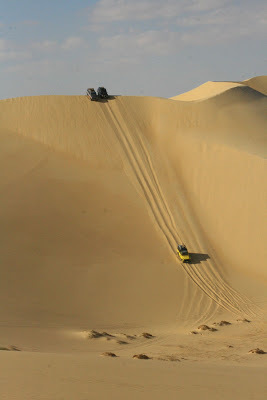 So here’s the picture: 20 Cairenes attempting to sandboard the dunes of the Great Sand Sea, in far western Egypt. Thinking it would be a repeat of the last time I sandboarded – a terrifying face-first rocket down a dune I couldn’t see the bottom of – I opted out. For decorum’s sake, I gave it a hurl one last time, going down seated, but did a fairly spectacular face-plant and filled my ears with sand. Soon everyone else who went up and down was mummified in a shell of sand glued together with sweat. 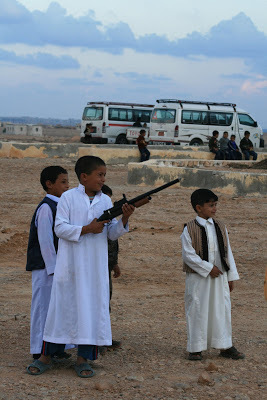 Despite it being winter, this is still the Libyan Desert, friends, and that means warm days and cold nights in winter. Eyebrows disappeared beneath a layer of caramel sand, and the ever-prepared girls were giving the packets of hand wipes a good working out. The sand came off in Bir Wahid, a hot water spring in the midst of the sand dunes. All the drivers converge there before sunset to hang out and chat, meaning the spring itself was full of bathers from all over the world, including a convoy of elderly Japanese. While I bobbed in the clean water, I chatted with a French woman, who, it turns out, was the sister-in-law of a lady I met at lunch in Mombasa, Kenya, a few months ago. The world is small and we are all but bit players. 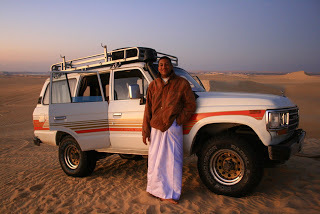 Later that night, our Schumacher of Siwa, Nasr (that’s him here), would drive us out to a Siwi ‘party’ to hang out around the fire and watch the local boys doing their distinctive dance. Nasr was, by this time, becoming addicted to the sound of our screams, and turned off his headlights to drop the 4WD down the dunes in the darkness. Scream? We screamed in unison, in harmony and in mild terror. It was music to Nasr’s ears. My ears are still doing that weird void of silence things after an assault in the cinema at Cairo’s glamour mall, City Stars. I know Egypt has only two levels of volume: off and 10 and like the rest of the region, love nothing more than a good blast of polar-strength air-con. Loud and cold is probably not the best environment to enjoy a movie, though, especially the three-hour doomsday saga of 2010. As interesting as the movie were the clientele: being the holiday period of Eid, Cairo is once again full of holidaying Arab guys (that’s Saudi Arabians, for you and me) with their long hair and fat wallets. Also, one of our gang was shocked to see a munaqqabah in the cinema. 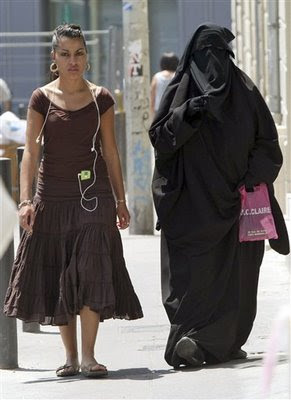 The niqab is the all-encompassing dress some women wear that leave only their eyes visible, and lately I’ve been noticing women on the metro who go the final step and have a piece of black gauze over their eyes so they can see out but you can’t see in. What’s so weird about a woman wearing the niqab in the cinema? I asked, only to be reminded that many in this super-conservative group consider movies and music to be haram, or against Islam. Recently, the imam of Al-Azhar mosque, the esteemed seat of Islamic learning, banned the niqab from female-only classrooms in the mosque’s schools, secondary schools and university institutions. The debate amongst bloggers is raging. I don’t know a lot about it: I do know women wearing the niqab aren’t so keen to sit beside the obviously non-Muslim foriegner, though I had a chat with a nice young munaqqabah last week on the train. Locals can’t understand my fascination with the topic, but I maintain that what people don’t understand, they fear. And in a time when the world is in religious upheaval, understanding and appreciation are the only ways toward acceptance and tolerance.